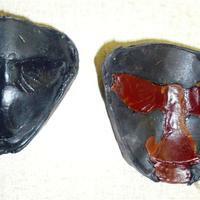 Small peace pipe mold for small-scale Black Elk. 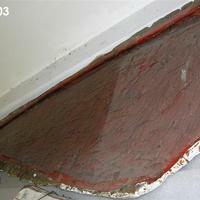 Plaster with rubber and wax core. 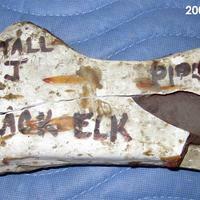 Written on mold is "Stall J, pipe, Black Elk". 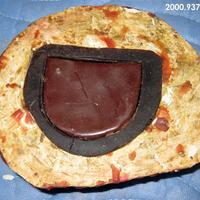 Small plaster mold with rubber and red wax core. 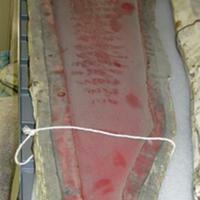 Mold has a wreath used in the Eaton Memorial sketch model. 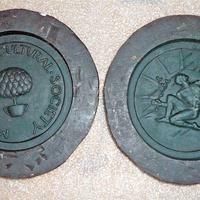 Two part rubber mold for Michigan Horticultural Society medallion. 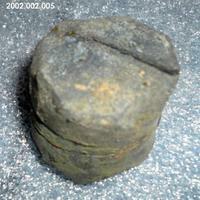 There is a reverse and obverse. The obverse depicts a small tree and the reverse depicts a man kneeling on his proper right knee looking up at the sky. He holds a plant in his proper right hand and the sun is in the background. 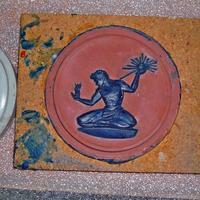 Blue wax relief of the Spirit of Detroit on rubber or fiberglass mounted on wood board. 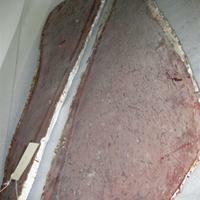 There are 2 other negative reliefs with this mold, one white and one brownish.